“Wait! We didn’t do mindfulness today.” A student reminds me as we are about to get started on some social studies reading. Like usual, we settle in. I ask the students to get comfortable, “Criss cross applesauce works for most people” I find myself saying (almost every day). “Your eyes are closed, my eyes are open. Settle yourselves. Be still. Begin to notice your breathing.” I look around and I see them settle. There are a few in each of my classes who still struggle with the settling part. Their legs can’t seem to stop moving for very long, or they are forcing their eyes to be shut because they really really really want to open them. They have gotten so much better though, in the past couple of weeks. In the beginning, I had to remind myself that this wasn’t last year’s class that already knew how to do it. But the results are stunning, anecdotally, of course. In my hour + math period, we do a minute or two of yoga and then a minute or two of mindfulness, and some days we try to take a brain break by running off some steam outside. Last week I reflected on the difference between the day that we missed the mindfulness and the day that we missed the break. The day that we missed the mindfulness was not a good day: My students struggled with keeping focused. It was then that I realized that maybe this mindfulness was better than I had thought. It’s hard to give even 2 minutes to something that isn’t directly related to academics, but these few minutes a day seem to be working. I look around at the quiet faces of my class, and feel lucky for this moment of quiet. I know the research says that this quiet mindfulness is good for their academics, their self-regulation, their focus, and for decreasing stress and anxiety. 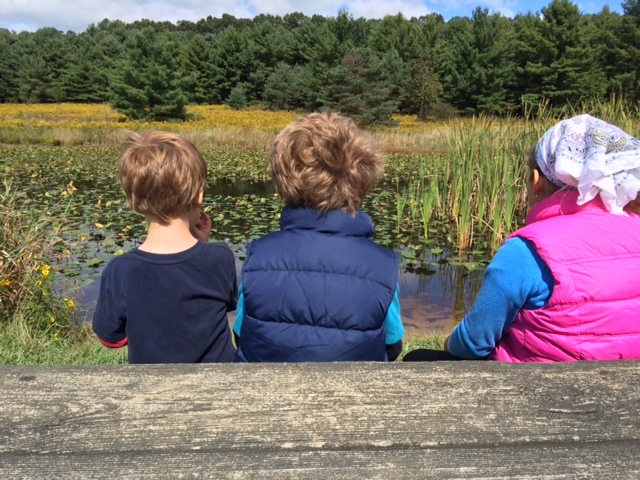 But at this moment, I just feel grateful for the peaceful calmness we are fostering in our classroom. It feels like a gift. H started 2nd grade this year. I wish you could have seen him before school started. He was ready to be a second grader: So excited to go to school. He loves learning, and his curious creativity drives him daily (in and out of the classroom). He started school at the end of August, and he still loves it. His teacher is also curious and creative, and she seems to get him, which is nice. It is especially nice because the teacher he had for kindergarten and first grade is what I would call an angel of a teacher, and I’m sure she will never be topped. (My love letter to her is a different post.) So we had wondered how the transition to a new teacher would go. This year, H said, just a few days in… “I know that I have Tr. R for second grade and third grade, but I should probably have her for fourth grade too.” Okay then! 2 awesome teachers in a row, who could ask for anything more? I guess I can. I can ask for no homework. H gets math each night, and then a selection of other homework assignments, given over the weekend and due on different dates. Make no mistake, the homework assignments are interesting and worthwhile assignments. There is a night of reading. Some weekends we have been good at getting all the assignments done so that we don’t have to worry about them during the week. I like spending time with my children, and sometimes the time we spend doing homework is enjoyable. Tonight I sat with H as he did his math. The practice was easy for him, so he spent some of his energy being creative. “Look, I can write my ‘o’clock zeroes’ with sideways 8’s!” We smiled and laughed and practiced some clock math. It was not a bad way to spend 15 minutes. Other times have not been so peaceful. More than once H has said, “I hate school.” You know when he says that? When it’s time to do homework. It is usually a battle. “You can do that after you do you homework,” is a phrase Mr. Thought and I say a lot around here. My middle school daughter loves school too. She struggles with some math concepts, and some might say that is why she should do more homework. But I’m not so sure. She has been working at school all day. She comes home and needs some down time. She needs some time to play, practice her piano, eat dinner, talk with us, help with chores. She needs to get ready for bed… There are only so many hours in the day. Several nights last week she ended the night upset that she hadn’t had any time to read. 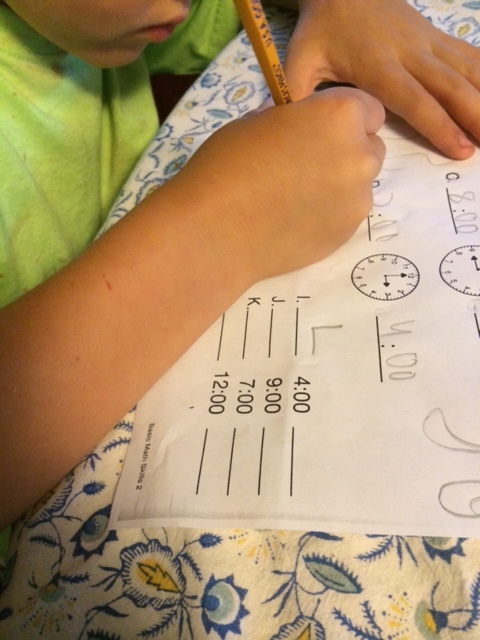 Now part of this is her own time management skills, for sure…but I have been waiting for her to catch the reading bug, and hate to see her not reading because she’s practicing long division. More than once she has said, “I don’t need extra help with my long division, I just don’t like math. I don’t care about it.” I’m thinking 15 practice problems at the end of a long day aren’t going to make her care about math. Full disclosure: I have a problem with homework in the elementary and middle school years. 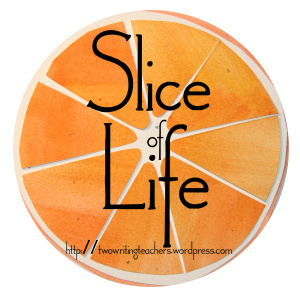 For the past month or so, I have been noticing slices of our homework life at my house. I have read The Homework Myth by Alfie Kohn. I have read numerous other articles and research summaries about homework, and I have seen friends’ postings on Facebook. I am not alone in my dislike of homework. I know. Some students like it. Some families feel it is important. Sometimes the practice benefits the student whether they enjoy it or not. I know. I know the pressure in my own teaching: So much curriculum, so much to do. There isn’t enough time. Ever. I wonder about homework. If we give practice homework that kids aren’t independent in, then they may practice the wrong thing, or struggle through an understanding in a way that causes more frustration than it is worth. If they are already independent in a skill, do they need that practice? If we give the same homework to every student, how is that differentiation? But if we take the time to differentiate, is that amount of time worth it for homework that they will be doing without our observation and support? If research studies aren’t showing that doing homework before high school leads to better study skills and organization, is it worth the headache? If homework is practice, is it something that you should ethically be counting in a grade that is meant to show how well a student understands? (Check out Rick Wormeli’s thoughts on grading homework here.) If homework does help academics, what gives schools the right to dictate a student’s time at home? If you were to look into a window of my children’s time at home, you would see what might look like a mess of legos and playdoh, paper, markers, dress up, dolls. . . Sometimes we spend a day on a beautiful family hike. To be perfectly honest, I wouldn’t want homework even if all my kids did in their free time was play. I believe in the power of play and that for kids, playing is their work. However they aren’t just playing. By 1:00 this past Sunday afternoon, H had already done the following non-homework activities: Cleaned and reorganized his bedroom, sorted legos with his 4 year old brother, researched how our cat goes downstairs by videotaping him in slow motion on my phone, and measured and figured out the timing of our ceiling fan. He slowed down for a snack and some time hanging out with Mr. Thought. L, my 10 year old, had a similarly busy and productive day, in addition to reading her current chapter book. I watched H’s slow motion video of our cat on Sunday afternoon, and hated that I had to say, “Hey! you could write about this in your research journal homework!” He didn’t want to open his backpack, but I made him. We printed out a picture, and glued it in. I hope I didn’t teach him that the only learning that counts is the stuff you do for other people. I hope he’s right, that a picture is fine, he doesn’t need to write for each entry. Instead of worrying about it, I settled in with my tissues and water (go away, cold!) and listened as Mr. Thought read Harry Potter to us. I’ve gone back to google 3 or 4 times in the past few minutes, always with a mission: find the lunch duty schedule so I can organize the team’s recess duties… And each time I go back to it, I open a different document. It’s not that I am wasting time on pinterest here, I am opening my reading plan notes, my conference schedule (and okay, once I opened facebook instead – but that was worthwhile, as I found this all about using bubble gum, and my partner teacher is planning a bubble gum lesson, so I believe that’s what you call kismet…) (Oh – and okay, this last time, I opened the document but then came here to write my slice…) I just have so many things to do and my mind feels scattered. At school I’m teaching, helping students with lockers, walking around getting people where they need to go, having meetings and occasionally stopping to pee (sidebar: It’s such a good day when there’s a stall with a clean floor, clean seat AND toilet paper, don’t you think?) My planning period is late in the day, and when my meetings are over, and I finally sit at my table, my mind is still going a mile a minute, trying to prioritize the one billion things that need to get done. I begin to work, and the students are back from Phys. Ed. After school, I take a walk to try to clear my head (and get a wee bit of exercise… more than the constant circling of tables in my box — I mean classroom.) I change my schedule, have a conversation with my instructional coach, and pack up. Home by 5:20. Washing lunch boxes, making dinner, eating dinner, cleaning up, making lunches, going outside to see the (amazing!) double rainbow and getting the kids showered, jammied, brushed, cuddled and read to (Harry Potter 5!) take me all the way until around 9:30… which is when I start… morning letters for tomorrow, finalizing plans, checking and responding to emails… and attempting to open that google doc, or the other one. Then I realize it’s Tuesday, and this is my slice: My brain, the second week of school. I know this work is worth it – every extra thing I do to help my students build a strong community is worth it. Every email I write to parents, every well thought out plan for my reader’s notebooks — All worth it. But this exact moment, my eyes want to close, and my brain is too scattered. So I will take the advice I know you, dear reader, are thinking while you read this: Go to bed! Get some Sleep! Then, fully rested: make a list! What other advice do you have? How do you keep your brain from getting scattered these first weeks of school?